Wow.Last night’s Anderson Cooper 360, his second since returning from Egypt this weekend, was especially passionate, causing a flurry of glowing tweets as he revealed reported lies and misinformation being released by the Mubarak regime. Coop went on to concentrate specifically on the words of vice president Omar Suleiman, accusing him of hypocrisy by blaming protestors and foreign journalists for creating a crisis. “The government doesn’t want to deal with Egyptian society with police tools,” Suleiman said, which according Cooper is a veiled threat of further police action. He throws back the accusation to the Mubarak regime, and accuses them of lying as a further failed attempt to control the country. At times Cooper came barely contain his emotion about the regime, which certainly adds intensity and emotion to the piece. Here’s where it’s going to get interesting. If Cooper continues to devote his show to Egypt coverage and to ‘fact-checking’ Suleiman, as he does in this vid, he will not only make himself the go-to person in America for Egypt but will essentially put himself on a collision course with Obama who is currently endorsing Suleiman. That would not only be an incredibly useful and necessary service but likely really good television. 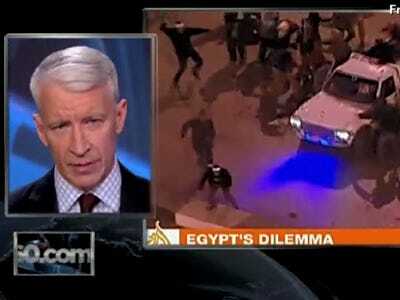 It goes without saying, now that Egypt is slipping out of the headlines, CNN’s attention will be devoted to the latter.